The other day, when I got home I had this adorable Choies sweater waiting for me! It’s just perfect for this time of the year! Stylish but super comfy and warm! I love the pattern! 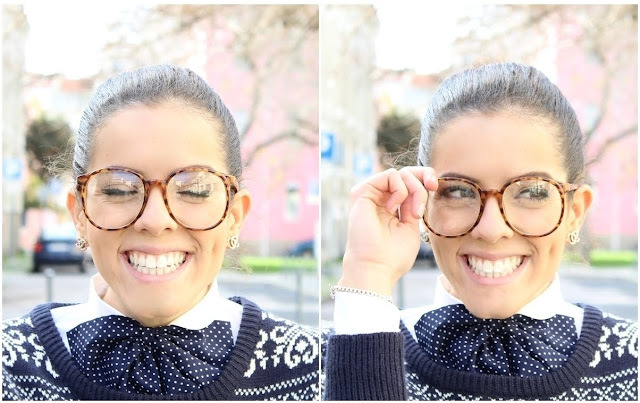 I decided to pair it with my all time favorite bow-tie, for a very preppy, school girl look! Noutro dia, quando cheguei a casa tinha esta sweater da Choies super querida à minha espera! É tão perfeita para esta época do ano! Giríssima mas super confortável e quentinha! Adoro o padrão! Decidi conjugá-la com o meu laço favorito para um look muito preppy! Sweater thanks to Choies. Zara skirt and heels. A camisola é giríssima e adoro a saia :) tinha saudades de passar por aqui! You have a really nice face, you are so cute!! I am loving everything about this. The polka dot bow tie gives it a very Gossip Girl feel, you look gorgeous. yuo are deliciuos with this out-fit. Fantastic fulard and glasses. That sweater is so gorgeous! I totally love your glasses as well. Such a cute look! Love the glasses too! I love this look!! Stylish, cute and classic! Great sweater, what a fun look! Nice pics, I like sweater. Have a grat day. super cute, preppy-oldschool outfit <3 love love love!! Hi! Thank you for your comment! I love your blog and your style! I follow you! I can follow you to me? A big kiss! i love your sweater <3 but you and glasses <3 perfect !! O detalhe do laço ficou simplesmente amoroso!! This is like my perfect outfit :) I love the preppy undertones and the cool jumper!! New post, come one, tell me what you think about it! Hii !! I just discovered your blog because you wrote me a comment in one of my looks of chicisimo. Thank you so much! This way I arrived here and I only can say that you have an amazing style...so chic!! You have a new follower. Really great sweater and awesome glasses! Preppy is really growing on me again! Adorable, babe! oh! I love the sweater!! so pretty in photos!! Very very nice! Lovely outfit! and i love your big glasses! Such a cute a funny outfit! You look adorable ! Love that skirt !